Are you ready to breath new life into that old staircase? These fix tips on restoring your stairs are a sure fire way to elevate your home. If you feel that your stairs are getting dangerously old or are no longer fit for use then you should consider getting a high-quality new staircase from somewhere like Pear Stairs. Adding solid wood stair treads or end caps are a beautiful upgrade for your old stairs. We also offer hand scraped stair treads for an extra special look! 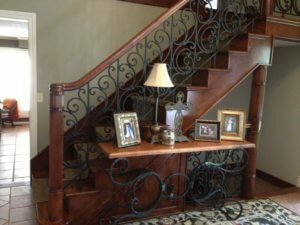 Few changes to an existing staircase are as dramatic as switching your wood balusters to iron balusters. We offer a wide variety of baluster styles from simple square bar stock to the hand-hammered iron balusters you may have seen in high end model homes. 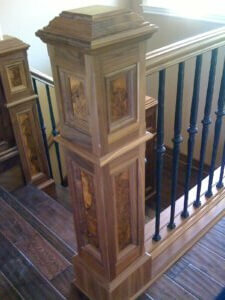 At Records Custom Cabinets and Trim, we offer several types of custom newel posts. Besides offering traditional newel post styles, we also offer the truly unique–from beautiful walnut paneled posts with burl walnut inserts, to custom carved round posts available no where else! Ever wished your boring, straight staircase was curved? We do that too! All our curved staircase components are manufactured right here in Wichita, Ks. Adding skirt boards to a staircase is another attractive staircase modification. Wooden skirt boards look great stained or enameled! Pick any or all of the above items and we’ll make that funky staircase a stunning staircase!